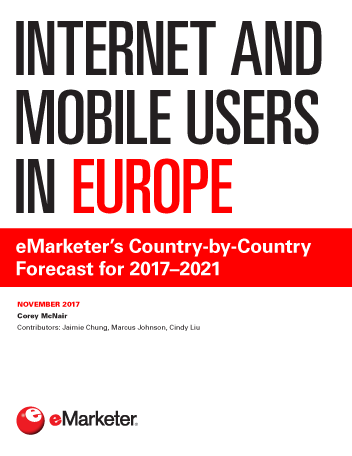 Across Europe, 582.5 million individuals will use the internet at least once per month in 2017, eMarketer estimates, up 2.7% over the previous year. While internet penetration is nearing saturation in several markets, smartphones are behind digital’s pervasiveness, as roughly three-quarters of internet users will use the device by the end of this year. More than three-quarters (76.7%) of the population in Western Europe will be internet users in 2017, driven by high web adoption in the Nordics and the UK. Internet penetration in Central and Eastern Europe will skew lower—59.5%—due to limited access in Russia and Turkey. Smartphone uptake has driven internet usage in Western Europe. Some 62.1% of the population will own and use a smartphone in 2017, compared with 43.6% of the population in Central and Eastern Europe. Penetration in the latter region will not cross the halfway mark until 2020. Because of widespread smartphone adoption and 4G access, several countries across Western Europe are planning to launch 5G coverage in 2018. Nordic countries are leading the charge, while Italy—where smartphone adoption is lowest in the region—aims to have five cities supporting 5G use. Some 44.7% of residents in Western Europe will use a tablet by the end of 2017, more than double the 20.6% rate in Central and Eastern Europe. Western Europe’s higher uptake is a result of broad internet access and more expendable income among consumers. "The number of smartphone users in Europe will total 451.9 million in 2017, a 9.5% increase from last year. By 2021, this user base will top 522 million."